After the insurgent uprising in Grozny in March, the NATO occupying forces were forced to pull back and consolidate their forces. Identifying the nearby town of Shali as a Russian strong point and the source of the unrest, NATO forces have made securing, and pacifying it, a priority. As NATO forces prepare for yet another offensive in the Grozny AO, Russian forces have dug in and are awaiting the inevitable onslaught. 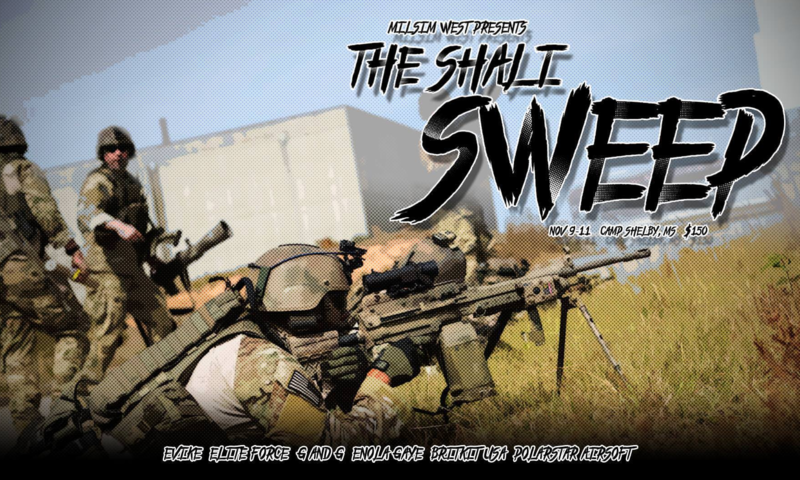 Join MilSim West for the THE SHALI SWEEP at Camp Shelby, MS November 9-11 for the seasons premier force on force war-gaming event. What you need to know before attending a MilsimWest event. A video prodused by Airsoft Obsessed that helps people understand what its like and what to expect when attending a MilsimWest event. The goal of this TACSOP is to provide current and future participants with a collection of rules and approved best practices. This guide is based on proven tactics, techniques, and procedures. MilSim West reserves the right to change any of these rules and communicate them to our participants during the event to ensure the high quality and safety of our event is maintained. 13-15 must have a parent or legal guardian as a registered participant as well as a notarized waiver. 16-17 only needs to sign the participant waiver and have your parents sign and notarize the Minor Participant Addendum to the waiver. 18+ are good to go. Do you allow Blank fire at your events? Yes, blank fire will be allowed for approved participants, 21 and over, who pass the blank fire inspection and safety test. If you are interested in running a blank fire weapon you must PM the MilSim West Facebook page for permission. It is the responsibility of the participant to make sure their firearm is in compliance with all relevant state and municipal laws. What are the Available Sides at this event? There are two available sides and three factions. There is a multi-national NATO force on one side, then a combined Russian with Regional militia on the other. What is a Regional Militia? This will be a perfect chance for people who want to play Russian, or with the Rushing Russians, but don't have the kit required for Russian kits. Unlike the Tatars at Crimean Crisis, the Cossacks will 100% be integrated into the Russian chain of command. What are the Uniform / Kit restrictions? NATO is limited to Multicam; however, if you bring a squad of 9 or larger you can wear any NATO based camouflage you want - as long as it is not Russian or US M81 Woodland. You must PM us prior to the event if you plan on doing that. Russian forces are limited to Russian camouflage only. The Cossack Militia are limited to US M81 woodland and OD green so please no high speed fashion items. This is a militia unit, think surplus not Magpul. What are the Weapon Restrictions? NATO is limited to US style weapons only (AR variant/SCAR/M249/M240/M60/M40/SR25/M14s). Russians are limited to Russian/Soviet weapons system (AK/SVD/PKM/RPK). Cossack Militia have no weapon restrictions but excessive attachments and optics are discouraged.